Why do all the hipsters play Williams? Topic: Why do all the hipsters play Williams? It seems that Williams appeals to a certain type of somewhat progressive/alternative player. Is this because they are a Mid-Western builder and so are not associated with Nashville? The clean, modern look, something technical? Any thoughts. Because they are well built,and great sounding,And nice people!! Posted 19 Jan 2019 4:45 am Re: Why do all the hipsters play Williams? I bought mine for its traditional look and feel, engineering excellence and classic sound. I'm not sure what a hipster is. I'm 68 next birthday. Because they're hoping that a little bit of that famous "Minnesota Nice" will rub off on 'em? You betcha, by golly boy. Add West-Coast Jam-Band Master, Barry Sless, to the list of Williams players. Nice. My wife is from St Paul, so I picked up a new ext.12 from them in November. I think we need to hear from some self-proclaimed hipsters about the guitars they play. I'm talking about the beard stroking, Aphex Twin listening, bring your typewriters to the high-line crowd. If you are one of them, what do you play and why? My impression is that Williams makes a pretty light steel that is very suitable for players that do a lot of flying. Bill is very easy to work with. Some of the players you mentioned are extremely busy and have very particular professional needs. 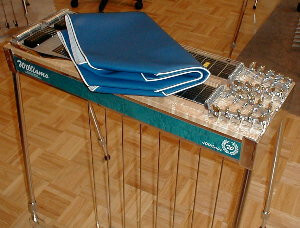 Williams also makes a 12 string guitar. Many builders do not. BJ Cole used to play a Kline steel and switched to Williams when Joe Kline stopped building. He told me that he found that the Williams steels totally suited him. Good point. My Williams is incredibly light compared to my old ShoBud and Bill sorted out an unusual 12 string copedant with no issues at all. Speaking of Aphex Twin... maybe we have to put Rains on the list? BJ Cole still plays his Kline actively as well as his Williams. How active can it get? So you're saying you think there a correlation between the "type" of person and the brand of pedal steel guitar they play? There's plenty of people out there who would probably fit your hipster definition playing Sho-Buds and Show-Pros and old MSAs too. 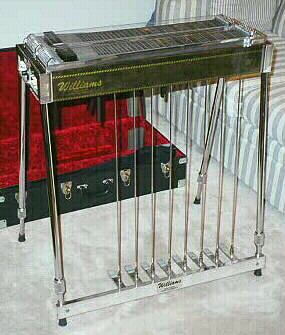 Williams steels are light, but the flight case that comes with them increases the weight substantially. My keyless s10 weighed over 50 pounds in the case. Kinda defeats the purpose for a fly gig steel. They look great.who wants to play something ugly. Hmmm..........I'm square enough to be unaware that some hipsters are self-proclaimed. I thought "hipster" had negative connotations. I also figgered "Aphex Twin" was an amplifier until Google bailed me out. Oh, wait--maybe he named himself after an amplifier? Highly hip if he did. I didn't dig that deeply. 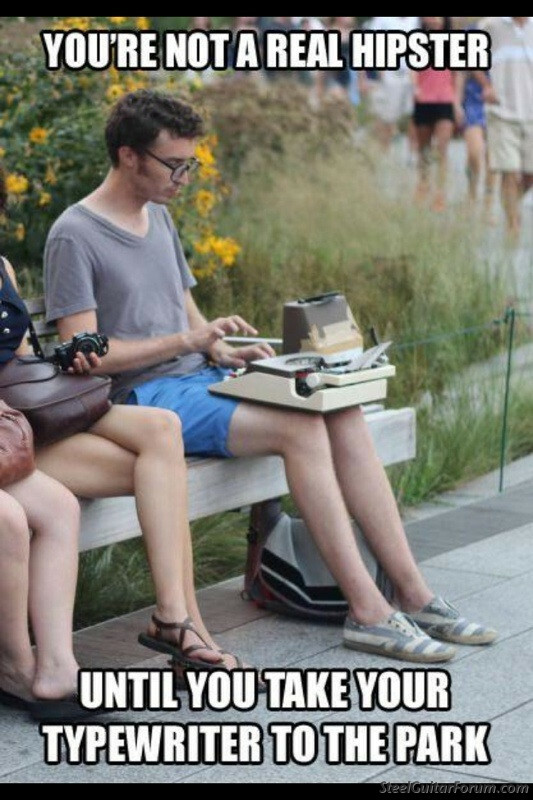 What does "bring your typewriters to the high-line" mean to a Yank? ...And I want to hear from them! If we were talking about regular guitars, this sort of association between players and instruments is obvious due to things like player models, i.e. fans of SRV play his branded strat. Do I think a more subtle form of player branding exists in the steel world? Absolutely. Just think about Franklin guitars. In England, the influence of BJ Cole on younger London players is obvious - three of the most progressive players play Williams (which are hard to get hold of) and two others play Universals. This is actually American in origin and relates to a popular meme derived from the reddit post - 'spotted on the highline'. The Highline is the garden bridge in New York. "This is a picture of me. The angle obscures the sign on my typewriter case, which says, "Stories composed while you wait. Sliding scale, donate what you can." Here's a picture of my typewriter, my case, the shoes I was wearing, my glasses, and a story I wrote that day: http://imgur.com/LmMzD". And I think it's a similar thing with other players being influenced by Greg Liesz (being maybe the most-recorded session player in the non-country genres). If he played a Red Baron student model, I would probably want one... and I'm not even a hipster. I just respect his approach which is so consistently on-point for whatever environment he's been thrown into. The man 'gets' how to serve the song. Too many big words and too many slang words for this old country boy. What was the question again? J.R. I've had two Williams guitars, the first was a keyless and weighed little more than my Les Paul Custom. The second was keyed and weighed only a little more. If I hadn't pretty much quit playing a few years ago, I would still have that blue one. (edit) I am not a "hipster", I'm just an old fogey steel hack. You didn't mention Wally Murphy, the last I knew he was still playing Williams guitars, and boy does he play them. If they stand up to his playing, they have to be great guitars. If you're looking for any kind of correlation, it might be worth looking at keylessness. The reason I looked at Williams in the first place is because they are one of the few that offer a keyless uni 12. The other contenders were BMI (not aesthetically pleasing to me although they obviously play just fine), MSA (out of my price range) and Excel (which I also have). So maybe some of these forward-looking players also favour keyless instruments. All credit to Williams for embracing the concept despite being a very traditional manufacturer in other respects.